A mourning Aeryn runs off into a city built around the business of talking to the dead. The others follow when they discover her mother is still alive. Sad Aeryn is sad. Fantastic episode is fantastic. After the poignant yet cartoony Moya antics of the last episode, we once again return to the ultra serious Talyn crew as Aeryn, still deeply mourning the death of T’John, retreats to a rotting outcast city of a world where she shacks up in a filthy hotel room, gets really drunk, and loses herself in the memories of John. Several times, she goes against her ingrained survival skills as she visibly contemplates suicide. She looks down to a knife in her hand while thinking about the pain in her chest and comparing it to the heart attack that claimed her as an old woman in another life. She casually walks out to her balcony, inching closer to the drop that will make her yet another forgotten corpse in the sprawling virus of a city that rots before her. This is how far she’s fallen. John changed her once, now he’s done so again. This is a world of death, where outcasts come to beg through whatever scant living they can as they slowly succumb to their misery and loathing and become just another body for their building’s owner to sell to visiting scientists for study. They’re all rejects. Maimed, diseased, insane, mutated, every one an outcast, a refugee from the world of the living. So it should come as no surprise that many of them have a connection to the land of the dead and peddle their mystical powers in a society that turns out to largely be a lie. People come to this world with the hope of reaching the dead only to slowly rot in a drunken pool of painful memories. It’s probably the bleakest setting this series has yet to expose us to. And just to make it all the more twisted, Aeryn meets a man, half his face altered to look like an insect, who claims to be Talyn, her father. He says a pact of survival was forged between Xhalax and he, and he’s lived in hiding on this world, studying the ways of communicating with the dead. And then Xhalax herself shows up and this Talyn turns out to be a lie, a ruse for Xhalax to murder in front of her daughter so she can find some semblance of satisfaction in making her daughter, the girl she lost everything to save, suffer through the same loss that’s haunted her since she first pulled the trigger aimed at her mate. After their last encounter, Xhalax learned nothing. If anything, the encounter – and the wounded leg she had to amputate herself after it became infected – made her hate the concept of love even more. She no longer wants to hunt Aeryn down because it’s her duty, she does it now because it’s personal. Her life is a misery, so she must make her daughter’s the same. Rescuing Aeryn as a child was the worst mistake she made and she’ll be damned if she lets it go. And, yet, maybe she does. Aeryn sees through the ruse, so when “Talyn” is killed and Xhalax turns the gun on her daughter, she’s met with a tired smile. Aeryn is already as low as she’ll go and nothing Xhalax can do will bring her lower, leaving her mother robbed of satisfaction and questioning what she was really hoping to achieve. Can she shoot her daughter? Can she kill the person who, no matter the misery, gave her the drive that’s carried her along all these years? Is she truly without love? She seems to be ready to give in to her expanding doubts, but then Crais, in his eagerness to save his comrade, bursts into the room and fires. Aeryn’s mother is taken from her yet again as Xhalax tumbles off that balcony, just another corpse swallowed by an eternally dying city. On a lighter note, we get to the rest of the crew. Stark takes charge as he’s obviously the most comfortable in a town of half-mad rejects, alternately guiding and losing Rygel through the streets and taking Crais into custody when they learn he didn’t kill Xhalax. The episode also plays up the feelings both Stark and Crais have towards Aeryn, and their secrets hopes about their chances with her now that T’John is gone. She can’t stand the touch of one and will only do the other if she can squeeze here eyes really tight and pretend he’s someone else, both of which are painfully honest revelations that hit each square in the gut, and leaves us unsurprised when Stark stays behind and Crais plots a course to find Moya, intending to once again head off on his own after reuniting his crew with their lost companions. And then there’s Rygel. What little comedy there is this episode mostly comes from him barking off the begging psychics that herd him on the street and the sight of him slowly chugging his hover throne up the outside of a skyscraper just to escape the icky fingers and broken eyes, but there’s also a surprising amount of heart from him this time around. Several times, he catches the name Kellor, the voice of an old, lost love, and he eventually tells Aeryn about her. It’s through him that we hear sense and compassion. If Aeryn loves John, would she want to dishonor his death by becoming what she has and wasting away like she is? Or will she go out and live. Even then, after losing Xhalax just as she was on the verge of winning the woman back, Aeryn dons a pressed uniform, pulls her hair back, and bottles up her emotions, once again retreating into the soldier she was trained to be. Stark has been creeping on Aeryn for a long while now. Most obviously in Self-Inflicted Wounds: Zhann was dying, Stark was becoming despondent, and he told her in that low serious voice how pretty she was. He’s kept it up over the season, and Aeryn finally calls him on it. Stark really does see himself as the protagonist of his own show, the hero of his story, the knight who rides to the rescue when everything else goes south. He plays a decent Batman Gambit, and really can save the day when everything goes south. Those are the good days. On the bad, he makes things worse or starts the boulder rolling in the first place. This time, I think he realizes that. He isn’t as heroic as the others (though he does get a completely badass moment when he’s facing down Xhalax’s mercenaries) and his girlfriend’s atoms were dispersed inside a wormhole. Faced with that, he departs. He says he’s following Zhaan’s psychic beacon, a reversal of their roles the last time one of them was dispersed, and maybe he’ll find something. Hopefully closure. At least he leaves a message this time. Rygel XVI, Dominar of the Hynerian Empire, was actually in love at one time. Sure, he’s got dozens of wives, but the one got away haunts him. How, exactly, Bleeding Eyes Murphy knew about that is a bit of a mystery. I suppose that, in a universe as large as that presented in Farscape, entities like Stark can’t be unique. Different cultures, different methods, different experiences, but similar results. Crais. 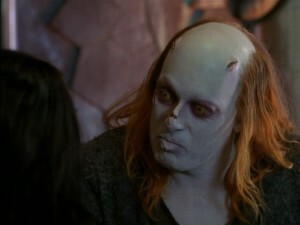 In the cold open to “Meltdown” he mocks Crichton’s suspicion that he didn’t kill Xhalax when he had the chance. Lo and behold, Crichton was right. If he was still alive, there would be this angry moment with guns and accusations and a little bit of reason. We still get it, with Stark standing in as Crichton’s surrogate. It’s not the same. During that confrontation, Crais reminds us that Talyn has a little bit of his mind. Xhalax is… man, she’s gotten bitter. Once upon a time, she did a terrible thing for the love of her newborn daughter, and she’s been repeating that act every time Peacekeeper Command sends her out to kill someone. She has decades of pain locked up inside her, and much like Season One Aeryn she doesn’t feel like it’s something that can be shared. So she inflicts it. She causes pain in others so they can feel what she’s feeling and do that whole “warriors understanding each other on the battlefield” thing. It’s the only sort of compassion a Peacekeeper knows, and in the end, Aeryn embraces it to wall away the pain of losing John. And Aeryn. Aw, man. So many times, this series has played the Death Is Cheap card, with even Xhalax coming back from her unseen death. 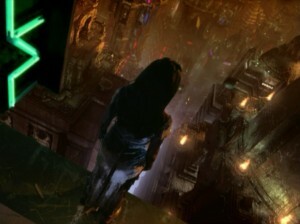 Aeryn tries to play it again, calling out to Crichton from the ledge outside her window, and nothing happens. He’s done it before. Turned to stone, shot out an airlock, exposed to vacuum in a transport pod. Heck, Aeryn herself has come back from the (mostly) dead. Why can’t he do it this time? Ultimately, unable to face the pain of his loss, she reverts to her Peacekeeper heritage. She locks away the better part of herself and soldiers on. Must agree with Noel, next week can’t come soon enough. From Claudia Black’s commentary: “One of the saddest things about saying goodbye to Farscape was saying goodbye to my working relationship with Ben, and saying goodbye to him. It’s gonna feel like leading-man infidelity if I ever get another role, and I have to work with someone else.” Cue Stargate SG-1! I wonder if that Diagnosan wound up with Xhalax’s corpse. Assuming she’s really dead this time. Now I want to know what they did with Crichton’s body. Bury it in the desert? Shoot it into the star? Burial at space? Stark pulled the knowledge of Aeryn’s room from a dying woman by crossing her over. Maybe… oh. OH. Ooooh. Um. Yeah, I’ll come back to that around February. This was another spectacular episode. It’s too bad I had to have my eyes closed for a good half of it. I was admittedly a little bit worried about how they were going to handle the first Talyn episode after John’s death. Mostly, I had been hoping that there would actually be a Talyn episode here, and not “oh hey we’re reunited now and here’s the other John let’s keep going”. This episode not only doesn’t take that route, but it also gives us a fantastic character study of the Talyn crew and all they’ve been through, fully living up to their previous episode. We also find out that Xhalax wasn’t dead after all. Crichton turned out to be not entirely wrong in his guess about what actually transpired between Xhalax and Crais. It’s worth mentioning, however, that Crais’ rationalization for leaving Xhalax alive makes total sense. We touched upon it back in that episode, but there wasn’t really any reason to believe that the Peacekeepers wouldn’t just send another squadron out to hunt down Crais and Talyn once Xhalax failed in her mission, and Crais knew it. The solution, therefore, was to make the Peacekeepers think they were dead after all, and so he made a deal with Xhalax, sparing her life on the condition that she report success to her bosses. The questions hanging in the air, of course, are whether or not Crais is telling the truth (which I honestly think he is), along with whether or not Xhalax kept her end of the bargain. Speaking of Aeryn’s mother, this is a far better closing to that story than we got before, and while there are still a lot of details that were left unanswered, I’m far more satisfied with her exit from the story here as opposed to her last episode. Aeryn’s journey through this episode is heartbreaking. She’s full into grief mode over her loss, and is feeling emotions that she’s still not entirely used to exploring. She doesn’t want to let go of John, and keeps seeing him everywhere she goes. How much of this is attributed to the odd nature of the planet she’s on and how much is just her working through things in her own head is a little up for grabs, but it was definitely the best way they could have worked Ben Browder into actually being in this episode. Up until the end of the episode, Aeryn has yet to accept John’s death. It’s telling that she brings up two bottles to her room. Is she just that eager to get drunk, or is she bringing that second one up for someone who isn’t there anymore, that her brain can’t quite fathom the idea that he might not be yet? Rygel gets to be the voice of reason in this episode, which I absolutely love. He’s the most level-headed in the situation, and by far the most objective out of them when it comes to Aeryn. Stark’s motives are clearly compromised by his desire to play the hero and save Aeryn, somehow winning her over. Crais may not have the same delusions, but his feelings are also obviously skewed when it comes to her. While Crais and Stark argue over why Aeryn has gone down to the planet alone, Rygel cuts in bluntly with the obvious truth – she doesn’t want to be around them. When Aeryn needs talking down from her contemplative suicide, Rygel’s the one who comes to try to comfort her, and is the only one out of them from whom it can feel genuine. One thing I have to ask, though. Did I miss something between Crais and the others? I was almost positive that Crichton’s twin was never brought up to him, and yet when they talk about it at the end of the episode, he just kind of accepts the concept as totally natural as if he knew all along. Given the nature of the Uncharted Regions – or are we back in Peacekeeper space, have they said anything about that? – there’s a planet for everyone. There are planets for lawyers, there are planets for backbreaking labor colonies, there are commerce planets and pleasure planets and even planets that are not planets at all, instead being bloated corpses of moon-sized creatures. With all this running about the galaxy, a planet of spirit-sensing opportunists and refugees doesn’t seem so farfetched in comparison. It could even be a cause-and-effect sort of thing; the sector attracts lost souls like moths to a flame, both living and potentially otherwise. Those seeking to disappear into Australia’s seedy red-light district New Jersey the ghettos of the ghettos are assaulted by memories of those they are trying to leave behind (or have unfortunately already done so), which may or may not be the result of con men, pseudo-psychic aliens, and a grungy hotel manager who I kept expecting to burst out singing. The darkness must go down the river of night’s dreaming. The supernatural has always been a bit vague on this show; anything strange that has happened could be explained by science, but a lot of it is left ambiguous. It’s especially intriguing given the horrifying brainpuppet creature thing’s last remarks – which, by the way, how did Aeryn forget that it had been left in her bedroom the entire time? Ohgod. The Vorc was bad because it didn’t move realistically. This thing did, and that made it so much worse. Tessa didn’t mention it because she had her eyes shut every time Not-The-Aeryn-Father was on screen, so she missed some even more brain-scarring visuals. Lucky her. Isn’t it strange that both of the False Fathers we’ve seen so far have been weird bug things? Or is that just me? Finally, we come to Rygel. Rygel, who has gained immense respect for the Sebacean and the look-alike hanger-on he’s been forced to deal with every day. Rygel, who actually cares what Aeryn and Crichton think of him, despite his assurances to the contrary. Rygel, who voices loudly that he doesn’t give a flying yotz about anyone but him because what Hynerian Empire would tolerate a Dominar who was a bleeding-hearts liberal? Not Hynerian Glenn Beck, that’s for sure. It’s Rygel who gets the closest to breaking through to Aeryn now. Whether he actually did is left to conjecture, as Aeryn reveals to her mother that she knew all along she was being played, and was merely going along with it so that she could feel something, because even hatred and disgust is better than the void left in her with CrichtonT gone. It might have even worked. I wonder if they saved some money by reusing Kuato?